» IS MDM the right solution? IS MDM the right solution? Data Integration across multiple data sources, where a rule set of authoritative sources for each field is used to decide which source to use for each data field, into a set of staging tables. For example, is SRC#1 for a specific field does not have data, it will try to use data for that field from SRC#2, and so on and so forth, until all fields are filled with the most accurate data currently available. Generate Business Metadata (not database metadata) which would record the source used for each data field after the above mediation process occurs, record the time stamp, and possibly other metadata for that data field. ETL process which will then insert these records from the staging table into a star schema in our Data Warehouse. When records are queried on the data warehouse, the users want the ability to also drill down to the metadata and verify WHERE the data came from for each field, when it was last updated from the source, and other possible business metadata. 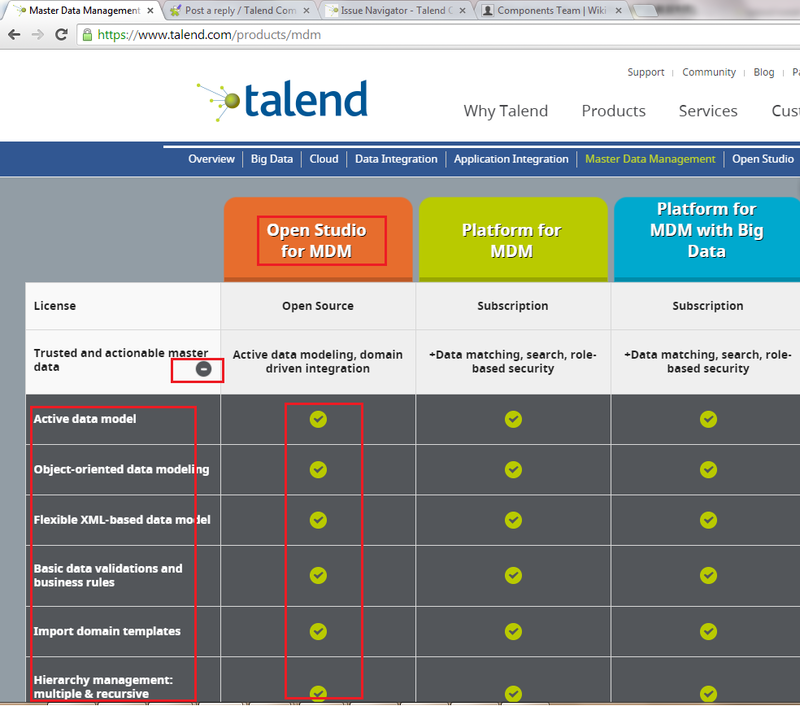 Would Talend MDM provide these features, or is only the Data Integration product needed? How is the Business Metadata generated/viewed? Would that be something we have to build separately or is it part of the MDM package? Re: IS MDM the right solution? Actually, here are DI, DQ perspectives in Talend Open Studio for MDM.